Merril was a mechanic back home in Allegan, Michigan. He worked for the county road commission. After boot camp he was trained in mechanics of airplane repair and in mid 1942 he was sent to Wheeler Army Base on the Island of Oahu. It was determined that Merril was too old to be knocking around on the islands to repair planes so he stayed right there at Wheeler for the duration. As you can see in the photo below, they had it a lot better than those on the front lines. There were many planes that passed through there he had to work on. Merril made Staff Sargent in the Army Air Force. Here Merril demon- strates how the guys got around from plane to plane to material to hanger, He was in command of this bicycle this time. 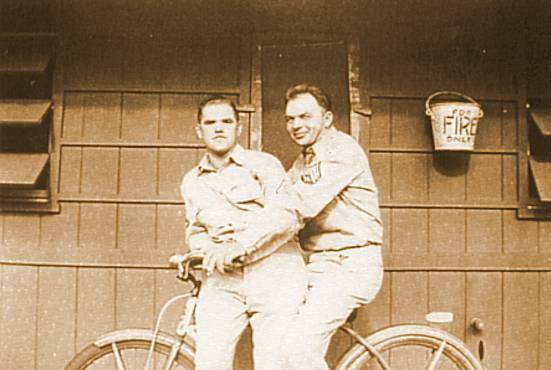 Near the end of the war, Merril's brother, Linn Jr.'s ship was in Pearl Harbor. Linn and one of his buddies got liberty and took a bus up to Wheeler to visit Merril. They stayed a couple days. Linn suggested it would be nice if Merril would show them around Honolulu. Actually things were quite slow at the air base and Merril's commander said "why not". See the type money they had to use while there. Merril or Linn did not have leave home during all the time they were in the Pacific. A group from Wheeler did get leave near the end of the war. 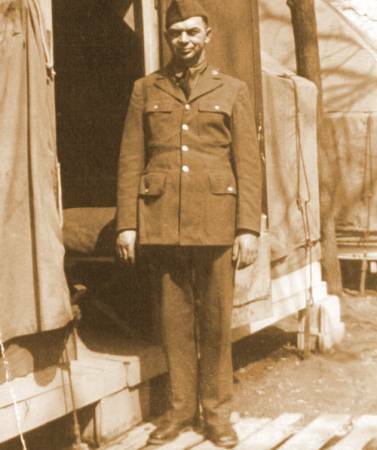 When Merril was on a troop train, heading back to California, the war ended. The guys in no way wanted to go back to Oahu so they put a sign on the outside of their passenger car, " STOP - DO NOT SHIP US OUT. ". they stayed in California until discharged. He worked on the McNutt Farm until he retired. Linn's ship eventually made it back to the east coast. The ship had to make several trips back and forth to bring the boys back home. From Baltimore the USS Adair APA-91 steamed up to New York where Linn was discharged and he made his last train trip in uniform. He went back to school and then worked for Kellogg until he retired.